Earlier this week, Yelp announced a new partnership with the federal government that allows agencies to claim their Yelp pages and respond to reviews. It turns out, however, that the TSA is like nah, screw that. Apparently, the Transportation Security Administration is just fine with their Twitter outreach, and have no immediate plans to give their Yelp pages any attention. In fact, a TSA spokesman said he didn’t even know about the deal. Castelveter didn’t rule out using the program in the future, but as of now the agency will not be responding to the reviews. This is especially funny, considering Yelp used the TSA specifically in their headline, and as the main example of how the initiative will work. “We encourage Yelpers to review any of the thousands of agency field offices, TSA checkpoints, national parks, Social Security Administration offices, landmarks and other places already listed on Yelp if you have good or bad feedback to share about your experiences. Not only is it helpful to others who are looking for information on these services, but you can actually make an impact by sharing your feedback directly with the source,” said Yelp. 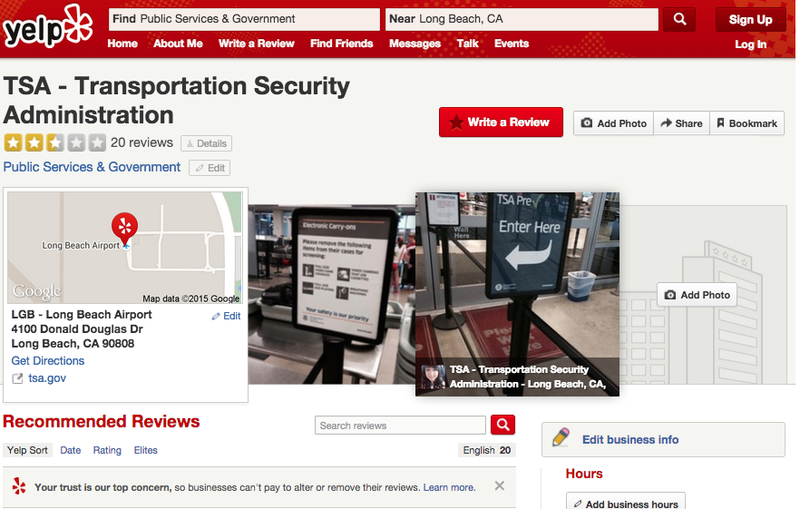 The “partnership” doesn’t force anyone to participate, and each government agency can decide whether or not it wants to deal with Yelpers – and it looks like, at least for now, the TSA isn’t really into all that. A General Services Administration official says that right now, only the State Department’s passport office has jumped on board Yelp’s offering.